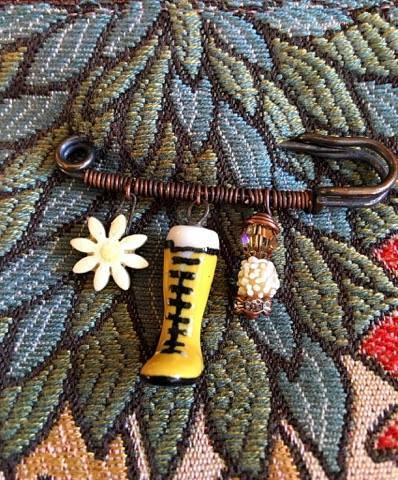 Using whimsical miniatures in your earring designs! 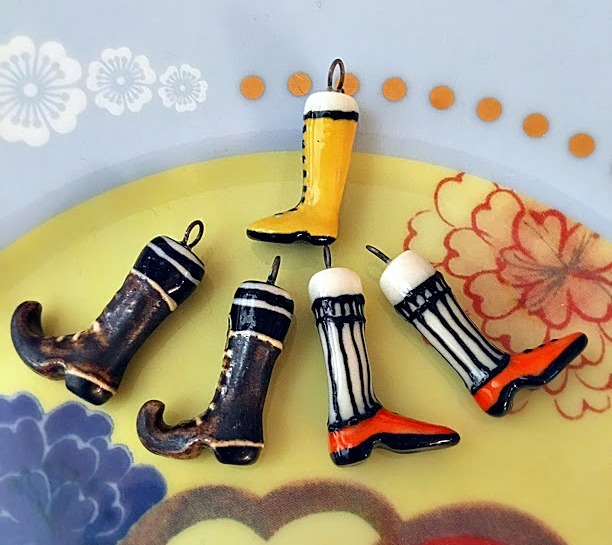 I've been collecting these sweet little ceramic earring pairs by Melissa Gabelle of The Clay Hen for a while. I have a soft spot for vintage items or ones with a vintage/antique feel like these! They really tug at my heartstrings! Turning unique shapes into earring designs can be a challenge, but I found once I jumped in, the ideas started flowing! I put all the little shoe pairs in front of me on my work table and asked each one ~ Who are you? The sweet little yellow boots looked like galoshes and thought might pair with some vintage 'rain' crystals and an umbrella! 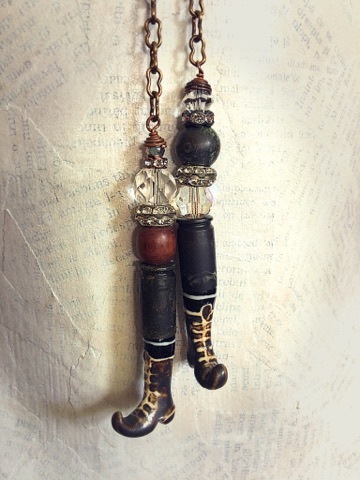 The crystals were salvaged from a 1930 necklace and I used oxidized over-sized bead caps to give the impression of an umbrella. Here are some little men's shoes that felt as if they belonged to a gentleman of the 1700's. I wanted to keep it a bit masculine, so I added some antique mother of pearl shirt buttons, some oxidized metal beads and some subtle sparkle with rhinestone spacers. These are quite possible my favorite! I get a French military feel with these....I could be all wrong but that's my artistic license, no? I added a little flare with the touch of red fabric and the brass wreaths. It took quite a while to find just the right components. I wanted to enhance the little boots but not overpower them. I wanted to add to the sweetness. I think I'm all set for Halloween! I went with the pattern of the socks and decided to go all stripes! Using Indonesian black and white stripe glass beads I continued to layer more stripes with some tin bead caps by Lorelei Hill Eurto. Then, softening the look with a bit of frayed silk. I was careful to consider the weight of the earrings. I never make anything that I wouldn't wear myself and I'm all about comfort. The vintage chain is from Allegory Gallery, more vintage crystals...and wait for it... the bead caps are hand finished bullet shells from Artwear Elements on Etsy! Last, but not least, a hand wired pin! I love this this so much! Thank you for joining me for this month's post of The Earring Whisperer! Until next time! Love all of them and your thought process! Very cute and creative jewelry! These clay boots are absolute winners! AND I love what you have done with them in your earrings and lariat designs - just great! These are all so great! I've loved seeing Melissa's shoes/boots, and it's exciting to see how you used them. When I saw the yellow ones before I read the post, I thought of lace up skating boots with a flared skating skirt of the bead cap. But once I read your description, I saw the rain boots and umbrella. Love them either way! Loralee, you amaze me. Every single piece here rocks, top to bottom, side to side. Your imagination seems endless. Thank you so much for sharing these! I tend to steer clear of whimsical components. I find I generally make them look "over the top," rather than perfectly complementing them as you have. Great work! This is a great collection of artwork! I am a BIG fan of Melissa's beads and I love how you paired them with various colors and materials. I find that sometimes when I buy beads that are unique in design I have a difficult time creating something with them. You've done an excellent job of pairing these beautiful focal beads with a variety of findings to create interesting and playful jewelry pieces. I love what you've done.